On their eleventh album, fifth in this decade, Jon Bon Jovi attempt to return to arena rock and roll with The Circle. Or at least that's what Richie Sambora wants us to believe. It may be more the case of 'what goes around comes around,' and it's coming around once again. Not that that's a bad thing. 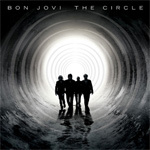 The Circle is pure Bon Jovi with big melodies, big choruses, and big hooks in that ramped up arena rock sound. But when the first single, We Weren't Born to Follow, sounds much like 200o's It's My Life and Work for the Working Man's bass line mimics 1985's Living on a Prayer, you wonder if Bon Jovi has any original tricks up their sleeves. But, then again, except for maybe the twist of Keep The Faith, most fans don't really give a damn. Bon Jovi is still doing what comes naturally without novelty or innovation. Jon and Richie are still crafting songs for the underdog, working class and downtrodden just as their New Jersey relative, Bruce Springsteen, has been doing for years. Work for the Working Man, Bullet, and Live Before You Die keep the Bon Jovi-crafted American spirit alive even while the politics and promise of Obama's hope turn elusive and stagnant. Still, as the once spandex glam boys approach 50-somthing men, The Circle seems to find Bon Jovi more somber and melancholy on the emotional When We Were Beautiful and the inspirational tunes, Love's the Only Rule and Learn to Love. Regardless, it's all good, and pure Bon Jovi rock and roll through and through. Recommended. Bon Jovi works their familiar angles on The Circle with big arena rock anthems for the working class and downtrodden. What goes around keeps coming around, and it's all pure Bon Jovi.